We’d love your help. Let us know what’s wrong with this preview of Madly, Deeply by Erica Crouch. To ask other readers questions about Madly, Deeply, please sign up. I'm a sucker for Edgar Allan Poe. He's someone who will always be at the top of my favorites list. Every time I hear about someone writing a story inspired by Annabel Lee, I get really excited. If they can capture the essence of the poem without losing their own voice, I'm a happy camper. And that's exactly what Erica Crouch did with Madly, Deeply. Poe's voice is not lost with Madly, Deeply. His impression on the story is still seen in Erica Crouch's haunting retelling. The essence of his dark, I'm a sucker for Edgar Allan Poe. He's someone who will always be at the top of my favorites list. Every time I hear about someone writing a story inspired by Annabel Lee, I get really excited. If they can capture the essence of the poem without losing their own voice, I'm a happy camper. And that's exactly what Erica Crouch did with Madly, Deeply. Poe's voice is not lost with Madly, Deeply. His impression on the story is still seen in Erica Crouch's haunting retelling. The essence of his dark, Gothic style is captured perfectly by the author and continuously reminded me of Poe. It's heavy on the emotions and twists. More than once, I was caught up in Crouch's world and had a hard time distinguishing it from Poe's own works. Everything about this story fit cohesively in a way that was befitting of the story. I thoroughly enjoyed the characters and their deep emotions. The descriptions were so stunning and detailed that I felt like I was in the story right alongside Anna and William. If you enjoy a haunting love story reminiscent of Poe, Madly, Deeply is the book for you. This was actually better than expected. I feel like a lot was accomplished in a relatively short book, and the ending was definitely bold. A bit too emo and dark for my taste, and the writing was somewhat iffy at times, but an enjoyable read overall. Poe fans would love this romantic take on the poem it was based off of. Some loves are not meant to be. Or they are, but not in the way you think. This is a difficult read for me to rate because this is a strange book that is about nothing and everything. It is heavily philosophical and the story is merely a vehicle for the theme, so much so that initially I was wondering if there would be a plot. The essence is life and fate, whether death is the end and most importantly for me, about moving on after loss. It is a very rare YA book that takes up Rating - 2/2.5 stars. This is a difficult read for me to rate because this is a strange book that is about nothing and everything. It is heavily philosophical and the story is merely a vehicle for the theme, so much so that initially I was wondering if there would be a plot. The essence is life and fate, whether death is the end and most importantly for me, about moving on after loss. It is a very rare YA book that takes up this kind of thing, and even rarer for it to do it well. I think William's recovery and growth was decently charted, if abrupt. But before anything else, since the summary is so vague, I have to mention what the book is actually about. Annaleigh, the protagonist of the story, who is inspired by Edgar Allen Poe's poem Annabel Lee, receives a proposal from her childhood friend-turned-love William. So they are engaged to be married and all is right with the world...or it seems. You see, Will's sister Mary is psychic and can see ghosts. She also has prophetic visions and dreams and the future is not looking bright for Anna. Since I don't really think I'm spoiling anything I will just go ahead and tell you that conveniently blond Anna dies on her wedding night. The rest of the story follows the three as they try to cope with the loss (Anna as a ghost) and move on. Yes I know, it's tragic. Terrible. All those adjectives which one would apply to feeling sad, which I would have if I actually cared about the characters at that point. It took me a while to understand the point of the book. Today I thought I'd review it in Kotaku.com style and use their headings. Extra note: This book is set in what I would say is mid to late 19th century America, judging by the simultaneous existence of corsets and photography. The writing style is fluid, graceful and mostly effortless. It matches the era and the inspiration, though it notably falls short of Poe's atmospheric stories. I say mostly effortless because initially it seemed a bit forced, but it grows on you. I appreciate that there were interesting similes and there was no excessive detailing. That's right, my purple prose alarm didn't go off. Interesting themes, as mentioned before. Unusually heavy subject matter for the genre, which makes me wonder if this can really be classified as YA. I think anyone could read it as the age of the protagonist(s) doesn't really make a difference. Their thoughts have nothing to do with their age. To pick up where I left off, the strength of this book is that it deals with loss and effectively encourages everyone to move on. It acknowledges the pain, the heartbreak but then says (rather like a magical girl anime!) "You're not going to give up here, are you? I expected more of you." I am not really sure how to feel about this. Sometimes I felt like I was reading a well written anecdote. Sometimes it was a long short story (it is only 174 pages...). Sometimes it was Chicken Soup for the Whatever Soul. It is not possible to treat it as a novel, given its length, plot development and the ending. I thought a lot more time could have been spent on William's later character development. His bouncing back from the depths of despair was only a couple of chapters at most, when it was the most interesting part. The beginning was too short for us to understand the characters and too long for anything of substance to happen later. In that case, why not spend more time on the core of the story? Or make the book longer as a whole. 1. Annabel drowns in the lake next to the Calloway house, wearing an enormous white wedding dress. When her body is eventually found by the townsfolk, the friendly family doctor says that they saw her dress and investigated the lake.Ding! If the lake is deep enough to drown in and she drowned because of the weight of her dress (explicitly mentioned), how could they have possibly seen the dress? Anna mentions she and Will never found the bottom of the lake. The dress is wide and heavy, not long like a red carpet. Also, when everybody was gathering around the lake and heave ho-ing Anna's body, why did no one inform Will, the master of the house? It's his estate and his wife's body. Even if the body had been someone else's, they should have told him before trawling his lake, right? 2. Will, upon finding Anna is a spectre and is actually dead, throws the magic necklace of convenience into the woods, in despair. Mary, who knows already that Will cannot see Anna without the necklace, just sits back and watches him throw it. When he panics because he can't see Anna any more, Mary has an "Oh, crap, the necklace!" moment. Will runs off to retrieve it, to find that it is hanging from a suspiciously convenient tree branch. I may not be an expert on projectile motion, but I'm pretty sure if you throw something while seated on the ground, it would not be lying on an empty tree branch, glinting in the light for you to find it again. 3. Anna's supernatural abilities are inconsistent. At first she has difficulty catching hold of a book because it goes right through her fingers. But later, she narrowly manages to enter the house before the butler, who can't see her, closes the door. This should not be a problem if she were insubstantial. Much later, she can, despite fading at an increasing rate, pull blankets and unlock a door for Mary. Make up your mind already. 4. And why is it that the servants of the house never notice Anna's disappearance? Surely it looks strange when the master and his sister are talking into thin air. 5. Mary's letter to Will. This has to be read to be believed. Mary noticeably writes sections in bold and Anna immediately deduces there's a secret message. Will? He notices "the care she had taken with choosing her words." Way to go with the irony, dude. Why is Sara roaming the halls of Calloway Manor? What relevance does she have to the plot? As far as I could see, the story would have functioned perfectly well without her. I understand bringing up story to highlight Will's doubly tragic loss but don't see the need to reanimate her and set her off like a clockwork doll to stalk him. This also begs the question, why isn't she fading like Annabel? The protagonist who died less than a week ago is finding it harder and harder to hold on, but the mother who kicked the bucket five years ago is still hanging on like a refrigerator magnet? If this is due to sheer willpower, she could have lived. Let's face it, her only role here is to be a spiritual mentor to Anna after she dies, which Mary could have easily done. It is very, very hard to become attached to the characters in this book. Both they and the plot, are, as Loki famously said in the Avengers movie, burdened with glorious purpose i.e. the theme. The problem here is that the theme is intrinsically linked to the humanity of the characters, so if you fail to make believable people out of them, it becomes difficult to digest the plot. And that, unfortunately, is the biggest flaw of this book. I didn't care about these characters. I didn't blink when Annabel died, was only mildly interested in Mary and for most of the book, wanted to replace Will with Gerard Butler so I'd at least have something to look at. We are told that Anna is a perfect, wispy blonde with a lively temperament and cheerful outlook. So is Barbie. Mary has been seeing ghosts since childhood and hiding this fact from everyone. This seems to have no more effect on her than the colour of her hair. Will comes off as a spoilt rich boy with parental neglect issues. Not grateful for a strong, loving sister and a girl who loves him deeply, he insists on being useless. All this, combined with the sluggish start where absolutely nothing of import happens, meant that I was on the verge of ditching this book. The ending just about redeemed it, but not enough, in my opinion. In the end, Madly, Deeply comes off like the ghosts it features: there, but not there. A strange mix of The Corpse Bride, The Sixth Sense and Byron's poetry, it doesn't really manage to do anything all that well but tries so hard all the same, that it cannot be called bad. I love Erica’s writing. I don’t know how many times I have said that, and I’ll probably say it numerous times into the future, but I do. I freaking love it. I love the metaphors and the prose and the feel. I always find myself catching my breath at the beauty of her words. Which is why she is hands down one of my favourite authors. I really liked Madly, Deeply. I loved that it was inspired by Poe, and that it truly k A copy of this novel was provided by the author in exchange for an honest review. I really liked Madly, Deeply. I loved that it was inspired by Poe, and that it truly kept to the gothic essence of his writing. It was beautiful. The only thing that makes this a four balloon read and not a five (because seriously, this is a beautiful book – the story is gorgeous and so are the characters but I’ll get to them in a second) was the pacing. I understand that a lot of gothic novels are slowly paced, but the action-y (well, gothic action) bits were the best. The moments when my heart was racing or breaking – these were the parts I loved the best, and I felt like I had to wait a while before these came along. Most of the in between parts were scene setting, or emotion analyses, but I felt that they could have been dispersed a bit more widely. But other than that, I adored this book. From the moment Madly, Deeply starts, you ship Annaleigh and Will. They are adorable. And so in love and they have a history and it’s beautiful and everything is sweet and romantic and then BAM. You want a happily ever after for these two? *cue Erica laughing evilly* Yeah, well. Needless to say my heart was all ‘noooooooo’ (along the strain of Luke Skywalker). When the ship went down. But then. BUT THEN! Plot twist! I won’t ruin it, but it’s beautiful and heartbreaking and asdfghjkl. I cannot even accurately describe the feels. Especially the fight scene between Anna and Will in the cabin. My heart was breaking piece by piece. I did not want to let go. Whilst the majority of Madly, Deeply involves lakes formed from your own tears, the ending is kind of uplifting in a really darn sad way. Like ‘oh, okay. They’re being big people. They’re doing what they have to do. Excuse me while I cry rivers of sadness’ uplifting. Which, now that I think of it, isn’t really uplifting for me as a reader, but more uplifting for the characters, and what they will face next. I would have absolutely loved Madly, Deeply to be a longer novel. I would have loved to read about Anna and Will as young teenagers falling in love, and getting to know each other, and dancing around their feelings. I think it would have been adorable. What else can I say? The world is beautiful, the characters are vivid, the storyline is great. Madly, Deeply is a gorgeous read for anyone who is a fan of the paranormal, love that spans more than one lifetime, and gothic prose along the lines of Poe himself. OH OH OH OH and when the cover made sense I just sat in awe. Like, seriously. ERICA, YOU ARE A GENIUS. Madly, Deeply touched a nerve, moving me in a deep way I can only say that I finished this book crying. Not only because it is a sad story, but because Erica Crouch’s way of describing profound and raw emotions is so beautiful you can’t really help yourself. This book is based on Edgar Allan Poe’s poem Annabel Lee. It follows Annaleigh Wells and William Callo Also published in "A Cup of Coffee and a Book"
This book is based on Edgar Allan Poe’s poem Annabel Lee. It follows Annaleigh Wells and William Calloway, two lovebirds who romance is simply perfect. However, their love story is doomed and on their wedding day the most terrible thing happens! Annabel Lee is one of my favourite poems by Poe. There’s a musicality to it that is breathtaking and Erica Crouch did an astonishing job in transporting the poem into prose. The way she describes the characters, the environment, the pain and romance, everything leads to such a beautiful tale I recommend everyone who enjoys Poe’s work to give it a try. I adored the gothic vibe this novel transmitted. There was this supernatural twist to the story that felt so natural, just like the characters did, without being too much or crushing the initial concept of the story. Everything in this book felt real, palpable and simply realistic. There were several details scattered throughout the whole book regarding Poe’s work. I enjoyed reading them and connecting them together. It made me grin and simply bow down to how delicate they were but at the same time how it felt like a special dedication. Though the beginning of this story was light and filled with romance, towards the end we have a feeling of desperation, an emptiness that slowly begins to consume William and you can’t help it; you end up crying. I did cry while reading, not once because I was so sad about what had happened but also because the descriptions were so genuine I felt it within my veins. Also, because it brought back some memories from my own personal losses! Erica Crouch delivers us a painfully beautiful, hauntingly awe-inspiring and emotional tale that will leave you in tears. Madly, Deeply is surely a perfect allegiance to its original. Once again Erica Crouch presents us with a truly magnificent piece of work. This book was so good that it got me thinking about it for days after I finished it. When you get into this book you cannot help but falling in love with its characters especially with Annaleigh. She's a sweet and intelligent girl that could make any man fall in love with her. Her relationship with William is, what I supose, every girl's dream in a sense that they knew eachother since they were kids and could not keep their eyes off of eachother. They were madly in love. 'Madly, Deeply', is a heartbreaking story. I remember finishing it at 2am and having to immediately turn on the tv to keep myself from crying like a little baby because this is not how books are suposed to end. Erica Crouch has such an amazing way to write since she puts down whatever she wants to say in a very accessible way, with a simple and to the point writing, without the need of big and complicated words. William and the poor Annaleigh. As we would very soon see. Seemed to tell their story beautifully. And it was something we all could see. Like Mary, the supporting lead. To both William and his Annaleigh. Of love, and death, and family, and grief. A story that could make you believe. A book that’s poetic, and captivating, and heartbreaking. And one that’ll you’ll never regret. … okay. So at the end there I couldn’t help but realizing that I couldn’t rhyme anything else and that I will never match Edgar Allan Poe. But that doesn’t matter, because that’s not the point. The point is that Erica Crouch has taken one of my all time favorite poems, and created an amazing book out of it. This book will not only make you believe in the most powerful, most heart-breaking, most powerful kind of love, but I’ll also leave you with a smile on your face and a tear in your eye (or maybe that’s just me). The writing was beautiful and heartbreaking. I felt like Poe himself had been the one writing this book, and that he brought to life his poem. My only complaint is that I wished to know more about the setting, but that’s just a personal preference, not a fault in the book. Overall, if you’re looking for an amazing romance, one that’ll break your heart and make you smile at the same time then read this book. A review copy of this book was provided via Netgalley in exchange for an honest review. I don't think I can fully express in words how much I love this story, it just isn't possible. I haven't cried this much while reading a book in a long time. This is also a really short book which makes the amount of tears that fell on my e-reader even more astonishing. 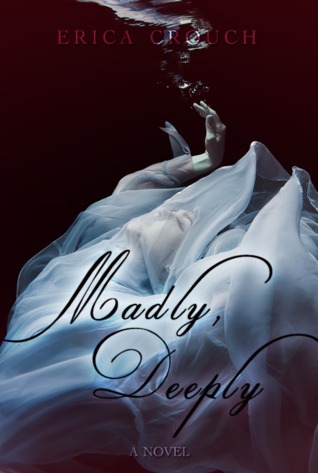 Madly, Deeply by Erica Crouch is a retelling of Edgar Allen Poe's poem Annabel Lee. Annabelle Lee is one of my favorite poems. I knew going into Madly, Deeply that it was going to be sad; I didn't expect the gut-wrenching emotion that I went through. The writing was stunning and gorgeous; perfectly matching the era. I think I have come to love Erica's beautiful prose the most about her novels. I want to purchase the paperback just to flag all of my favorite quotes! The writing just made the romance even more all consuming for me. Annaleigh and William have this soul mate type love and you never actually see them fall in love, that happened before the start of the novel. Despite not seeing how they feel in love it still pulled and exploded my heart with so many feelings. This story has ghosts, love, and will leave you with a heartache that you won't believe. Madly, Deeply is ethereal and beautiful, but unbelievably sad. It is definitely one of my favorite reads of the year so far. If you are a fan of Annabel Lee, then you must read this. When you know the ending of a book will be sad and your heart gets ripped into pieces anyway, it has to be amazing. You need to read this book. It is a fast read that you will fall in love with. GO FORTH AND FEEL ALL THE FEELS!!! P.S It is only $0.99, even more reason to go and read it! Madly, Deeply, moved me much in the same way as the title implies. This rich sweeping saga reminded me of a classic Victorian Goth romance where love, life, and death can all come together and transcend through time, making our couple's love eternal. Annaleigh Wells and William Calloway are the doomed lovers. Ms. Crouch did an incredible job of writing their love story. It was compelling, intriguing, and beautifully written. I could feel the love between Anna and William as much as I could feel the suffering of both when fate tore them apart. The description in the novel was top-notch and made me feel like I was taking a virtual tour through Anna and William's everyday life...the way the lake was described, the large house, simply stunning. And I need to take a moment to remark on the cover. It is gorgeous and befitting the book. This is one where it's not just another pretty cover, what lies between is pretty as well. This is my first time reading this writers work, and she did a fab job, I'll be making sure to read more of them. Madly, Deeply tells the story of Annaleigh (Anna) and William, these two childhood sweethearts whose love is emotional, moving, and doomed from the very beginning. These twos love is so strong not even Heaven's Angels could tear them apart. It was spine chilling despite it not having the HEA were so hoping for. Based on the poem The Annabel Lee by Poe, Erica has done a magnificent job in transforming this into a bone-poking love story, that will rip your heart apart, then take you on a journey of recovery and repair. You could feel ALL the motions that were going from Anna to William, then from William to his Sister Mary and even the loss of their parents too, at times the emotions took over and there's nothing from stopping the water works, especially the ending....that was a moving scene. The characters were pretty good and all of them are interesting. They're flawed and that's why they seemed realistic for me. Everything else was just amazing! From the beginning until the ending there's only one word in my mind and that word is, WOW. Madly, Deeply is such a great book and it was worth reading. Hands down to Erica Crouch! A free digital copy of this book was provided by the publisher in exchange for an honest review. Thank you, Patchwork Press and Erica! Annabel Lee by Edgar Allan Poe is my number one favorite poem. Its lyrical lines, bittersweet story and vivid imagery makes it one of the most memorable and unforgettable poems that I have ever read. When I saw that Erica Crouch, an author with a beautiful writing style, had written a story based upon the poem, I knew that I couldn’t pass it up. Madly, Deeply invol A free digital copy of this book was provided by the publisher in exchange for an honest review. Thank you, Patchwork Press and Erica! Madly, Deeply involves two lovers; William and Annaleigh at the pinnacle of their romance. As it is based on a poem, it was obvious that their love was doomed from the start but me being the idealist, I refused to dwell on that. I wanted to hope that in this story, the sweethearts would finally get the happily ever after that they deserved, but as usual, I’m getting too far ahead of myself. But always, the mist and the water – two lovers divided by the thinnest of veils – pulled back at the last second, inseparably alone. The most noticeable aspect of Madly, Deeply was the author’s writing style. As with her other works, Erica Crouch is a word wizard. She strings them beautifully, sentence after sentence, that it is impossible for the reader to not fall in love with the entire story. There were no unnecessary and irrelevant words for each served a definite purpose; to make the story flow so much so that the reader could find themselves not as mere spectators but rather, as characters in the book. Every phrase breathed the chilling atmosphere of Madly, Deeply and as the plot drew closer and closer to the climax, so did the words make me more and more breathless. Basically, it was so amazing that I wanted to weep. Perhaps the future wouldn’t be as terrifying as she believed. The unknown didn’t have to be scary. Possibilities were hopeful – there was so much to live for, so many maybe’s and what if’s that life could be whatever she made it. Aside from her unique style, Crouch also has a talent for creating dynamic characters that feel very much alive. When reading books by an author whose works span into a number of genres, I often sense that the figures in their stories are mere repetitions. Perhaps replaced with a different name or a different background, but similar nonetheless. However, this was unseen in Erica Crouch’s works – here and in her Ignite series. William and Annaleigh were individuals in their own story, independent from Pen and Michael’s tale in Ignite. Madly, Deeply contained only a few main characters; Annaleigh, William and William’s sister, Mary. Instead of hampering the story’s development, they allowed it to grow and take a life of its own. It didn’t feel as if an external narrator was telling the story. In fact, it didn’t feel as if I was reading a story. Rather, it was as if I was living the story and I think that that is an extremely difficult thing to achieve. To have a reader feel that the story is real and alive is one thing, but it is no easy task to make them feel as if they were in the story themselves. To be honest, Madly, Deeply was slow and paced lethargically. While it may leave other readers disenchanted, I personally found it charming. Erica Crouch allowed her characters to grow, letting them take their own path instead of constricting them to the box that she had sketched during the initial phase of the novel. This method receives nothing but high praise from me because as with every single one of her books, each character was striking and unforgettable. The second half of the book deals with grief, loss, and pain, all of which Crouch translated excellently. She doesn’t downplay nor does she exaggerate misery and her portrayal of it was realistic and rational. The dialogue and the inner turmoil that William went through was very believable, seemingly drawn from the author’s personal experiences. Grief and dealing with loss was depicted in an outstanding manner in this novel. It didn’t take William a couple of hours or even several nights to completely heal. It showed the animalistic and savage part of grief; the one which most books tend to gloss over. William went through different stages, roller coasters and denial. He was superbly written, which made it easy to empathize and identify with him during the latter part of the book. It was a peculiar kind of torture, living beside the dead. There was no future here, only past. It was living in a memory and never wanting to acknowledge the present that was so empty now that they had gone. I discovered Erica Crouch and the Patchwork Press family when my blog was in its baby steps. Now that I have grown, this family has also developed along with me and I’m pretty sure that I’ll be sticking around for a little while longer. Madly, Deeply only cements my conclusion that this publishing house churns out beautifully written books filled with incredible stories and amazing characters. Madly, Deeply undoubtedly deserves every bit of praise that it has received so far. This review can be found on A Reading Addiction! Honest YA book reviews :) Also on Netgalley. What first attracted me to Madly, Deeply is that it is inspired by Edgar Allan Poe's poem Annabel Lee, a poem which I have always loved. It struck me as a really amazing idea to write a novel based on a such a vivid, dark poem and I couldn't wait to get stuck in and see how Erica Crouch would weave the th This review can be found on A Reading Addiction! Honest YA book reviews :) Also on Netgalley. What first attracted me to Madly, Deeply is that it is inspired by Edgar Allan Poe's poem Annabel Lee, a poem which I have always loved. It struck me as a really amazing idea to write a novel based on a such a vivid, dark poem and I couldn't wait to get stuck in and see how Erica Crouch would weave the themes of the poem into a novel. Madly, Deeply centres around characters Annaleigh and William, who we meet at the very height of their relationship when they are deeply in love and desperate to get married. Of course, things do not quite work out as they had always planned. I loved all of their interactions as their dialogue always flowed well, and Crouch gave just enough backstory without dumping information on the reader. As we come into the story they are established as a couple, so I was glad that they knew each other so clearly that it was easier for me as a reader to get to know them both individually through each other's eyes. Before reading I wasn't entirely sure what the main themes in the novel would be exactly even though I had a good idea about it due to Annabel Lee. I was swept along with the well-paced flow of the story and I loved Crouch's writing, which was imaginative and beautifully descriptive. Reading some parts in the dark seriously gave me goosebumps. I loved the descriptions of the setting, the huge house and the eerie lake, the extravagant gowns and the grounds of the house. A favourite quote of mine was a description of William's sister Mary – "She was always glowing, as if she had stolen the stars from the night sky and swallowed them whole, wanting to shine from within." "The anguish of grief, it turned out, did not lessen once acknowledged. It wasn't as easy as a scraped knee, where a good cry would distract from the pain until the weeping stopped and the cut was bandaged. Once you touched it, grief only grew. It took on more, swallowed you whole until that's all there was. Grief was an egotistical emotion, unsatisfied until it became the only thing a person knew, the only thing they could see." I loved Madly, Deeply, especially the beautiful writing style and imagery, as well as the three main characters, Annaleigh, William, and Mary, who I liked individually for their own personalities. I also really enjoyed the supernatural elements and thought it brought an interesting next level for the grief suffered by the characters. I would definitely recommend Madly, Deeply for anyone, but especially for fans of darker emotional romances such as Wuthering Heights, and of course fans of Edgar Allan Poe! Have you read Madly, Deeply? What were your thoughts? I don't know why I thought that a book that was a retelling of Edgar Allan Poe's Annabel Lee would do anything except make me cry ugly tears all night long. I've been excited to read this book since Erica announced it, mostly because I loved her Ignite books and I love retellings, but I seriously should have known better. Annabel Lee is so full of heartbreak and Erica's story remained true to the original while still maintaining a fresh new voice. I was hooked on Madly, Deeply from the first sentence. Erica just has this way with words that made me want to keep reading even though I just knew something terrible was going to happen. Her descriptions of Annaleigh, William, and their world are flawless. Instead of telling us how strong their love is, she shows us. Every word, every action drips with their love for each other and it's no wonder even the angels envied it! I loved the gothic feel of this book, and I loved the little bit of magic that was woven in. The setting is haunting enough as it is and it just makes everything feel a little bit darker and a little bit more other-worldly. I often found myself thinking, "that seriously did NOT just happen. Things will right themselves in the next section!" The Victorian feel of the book really made this story that much better and I'm not sure it would have had the same impact if it was set in any other time period. I'm also kind of a sucker for books set in the Victorian era, so I just loved all of that. One of my favorite parts of this book was how it was broken up into sections based on the stanzas of the original poem. It doesn't exactly follow those stanzas, but it does give an idea of what's to come and what might happen next. The crying, for me, started around the second stanza, and quickly changed to ugly crying by the third stanza (for the rest of the book....). Especially after Annaleigh and William's fight in the cabin. That scene took my hurting heart and broke it into a million pieces. The end, although not your typical "happily ever after" was satisfying and still happy in a way. If you read this book, you'll totally know what I mean. I was still crying all over the place, but my heart started to mend so I walked away feeling a little bit better. But Madly, Deeply has stuck with me for several weeks while I've tried to write this review and I just can't get it out of my head. This was such a gorgeous heartbreaking book. You have filled my yesterdays with so much hope and love that every today feels like magic. I want to spend tomorrow with you. I want to spend every tomorrow for the rest of my life, and whatever life comes after this, loving you. I want the angels to watch us with envy, to dream that they might one day understand another as much as you do me and I you. Whenever I see that the genre of a certain book is YA, I cannot help but think of it as something that would be childish, or partly-childish. I know it's not a good general-ism but I have read hundred of childish YA books to make me wary of this particular genre. But this book was never childish. The love between Annaleigh and William was so breathtakingly pure, my eyes weren't able to stay dry while reading this book. At first sight, I didn't understand the significance of the cover of this book but when I finished reading, it was clear that the cover coincided with the plot. There were some changes to the cover that I would have liked for example the name of the author could have been white to be seen clearly and the girl in the water should be illuminated more so people could know what the cover is much easily. "Fate doesn't have to be fair or make sense. It just has to happen, one way or another"
I was expecting this to be a lengthier book and sometimes the chapters were cut in a way that it ended abruptly which made reading the book slightly confusing for me. With all that being said, this was the first book from this author that I have read and it would certainly not be the last. This is based on a poem by Edgar Allen Poe, and is one that remember reading in high school and I loved it. So, there was no doubt in my mind that I needed to read Madly, Deeply. This follows two lovers, Annaleigh and William. They have decided to get married, but it doesn’t work out like they planned. Neither of them know that Mary, Williams sister, has been hiding that she has visions of events before they happen. She has seen something that can tragically change the future for Annaleigh and William and tried to prevent it. And so begins a torturous, emotional journey for William. Annaleigh and William are wonderful characters. So strong and determined. They grew up loving each other, and William has went through so much with their own losses and family issues. Him and sister have learned to depend on each other. And Annaleigh was there for both of them, and Mary has always wanted a sister, and now that William is marrying, she will have one. She was so caring and so sweet. Who wouldn’t want her for a sister? This is one of those book that will rip your heart apart and repair it ever so slowly. The Annabel Lee poem is one my favorites from Poe, and Crouch has captured it beautifully. Annaleigh and William’s love is so deep and meaningful and you feel it, with every page. Everything about this is just gorgeous, from the setting, the lake where the wedding took place to the cabin where William goes to stay in are vividly described, you feel as if you are there with them all. Of course, from the poem itself, you know this isn’t a read that is all happiness and sunshine, it is raw and emotional and my heart hurt, a lot. It is so hard to be able to describe it all to you, and I know I am being a little vague, but I think it is meant to be experienced, and those who love the tragic type romances will enjoy this so much. Madly, Deeply is a beautiful story of love that transcends time and, and the writing will pull you in and not let you go. I love this book! When I saw Madly, Deeply on NetGalley, I didn't know what I was getting into. The cover was lovely, the blurb even more so, and my expectations were spiraling upwards faster than I can scream, "Stop, it could be a TRAP!!!" as lots of books with gorgeous covers and equally arresting blurbs are wont to do. But before I knew it, the green button touted the words PENDING, and my request was sent. Fast forward a few days, and a copy pops up on my dashboard. And because I want to prolong the delicious When I saw Madly, Deeply on NetGalley, I didn't know what I was getting into. The cover was lovely, the blurb even more so, and my expectations were spiraling upwards faster than I can scream, "Stop, it could be a TRAP!!!" as lots of books with gorgeous covers and equally arresting blurbs are wont to do. But before I knew it, the green button touted the words PENDING, and my request was sent. Fast forward a few days, and a copy pops up on my dashboard. And because I want to prolong the delicious suspense that is just killing me, I finish off the other new books first. (Yep, selecting which book to read first - and last - is this dramatic for me.) When I finished those, I sprawled on my bed, just because I have had enough of draping myself in my mother's chaise lounge earlier, and read. And read, and made pitiful moaning sounds read, and made more wounded, dying animal sounds read. Until it was The End. Ladies and gents, Madly Deeply, is a short book, but it has also got to be the up there with the most gutting, let-me-splash-some-alcohol-on-your-wounds-and-sucker-punch-said-wounds book I've ever read. My dear Ms Crouch, do you have poetry book-protein shakes for breakfast? Grilled poetry books for lunch? A light poetry book salad for dinner? No? ARE YOU SURE? Everything in this book is just pure poetry - the kind that is just obviously effortless, and sounds like it just comes naturally to the author. The narrative is lush, evocative, and all sorts of wonderful that it just is very fitting for the novel, which is a derivation of Poe's Annabel Lee. I LOVED it because it has just the right amount of length to it - effectively without overstretching the story and overdramatizing the plot that some books are wont to do. It's short, but it's incredibly bittersweet because you have these two amazing characters who are so in love with each other and who are just about to start an amazing life together, only to have Fate intervene and crush everyone's dreams. Madly, Deeply inevitably cuts readers where it hurts the most, but it will slowly soothe you, and at the end of the book, the reader will inevitably subconsciously touch the gash, only to find healed, yet puckered skin. I cannot recommend Madly, Deeply enough to Poe fans and bittersweet romance aficionados alike. When I received this book for review, I was really excited. I am a huge fan of Edgar Allan Poe and specially his poem, Annabel Lee. And this book is a retelling of the poem, so this was definitely a plus. Annaleigh and William had a love that went beyond all reason. It was as if they couldn't be without each other, in life and in death. But fate had different plans for them and it all started on their wedding day. This book is an eerie, dark read. I loved the author's writing style. It fit perfectly with the surrounding gloom and tragedy. Beautiful lyrical prose is what describes it. And Crouch's descriptions are a treat to the eyes. You can vividly imagine the beautiful surroundings. Then, there are the characters. We don't have that many; there is Annaleigh. Whom is a brave, sweet and lovable girl. And William, who is everything a girl can ask for. Then, there is William's sister and I absolutely loved her. She added a lot to the book considering that she was just a secondary character. The romance is the main subject of this book. it is always there, creeping up on you. And I found that I didn't really mind that this book was mainly focused on the romance and not much of the paranormal aspect of the story. I loved that the author used a different approach, when this book starts, Annaleigh and William are already in love and have been together for a long time. That was definitely refreshing to witness. Madly, Deeply tells the story of Annaleigh and William, childhood sweethearts whose love is emotional, moving, and doomed. It's based on Annabel Lee by Edgar Allan Poe and is as eerie and wondrously gothic as you'd expect. I loved the atmosphere and the anticipatory tension Erica Crouch set up, how it built and built, the sense that something was very wrong. There's a great unease in this book, and it was that, coupled with the aching loveliness of the romance and the lyrical quality of the writing, that made this book something special. I've been searching for a book like this for so long, and I'm very happy to have found Madly, Deeply. The story itself is sadness from beginning to end, the setting and world building subtle and vivid, and the characters so easy to love that you feel their pain along with them. I didn't enjoy the end as much as the rest of the book. I found I was more invested in Annaleigh and William's relationship, than in William's recovery ad acceptance. I was hoping, right up to the end, for a conventional happy ending, which was dumb on my part, especially since this book is based on Poe. But I enjoyed the story overall. I received a copy of this book via NetGalley to review. All opinions below are completely mine. Anna and Will are, well, madly, deeply in love with one another. Theirs is a love so perfect that it almost made me want to hurl. But not in a bad way, if that makes any kind of sense (it probably doesn't). And while their love for one another may be perfect, the other aspects of their lives are anything but. Both characters experience hardships in thei I received a copy of this book via NetGalley to review. All opinions below are completely mine. Anna and Will are, well, madly, deeply in love with one another. Theirs is a love so perfect that it almost made me want to hurl. But not in a bad way, if that makes any kind of sense (it probably doesn't). And while their love for one another may be perfect, the other aspects of their lives are anything but. Both characters experience hardships in their lives that they must overcome. Review is based on the story and the narration not the quality of the Audiobook. Erica Crouch has succeeded beautifully in giving each stanza in the poem a back story. Well written story with a few little twists told in a beautiful but sad and haunting way. You know how the story will end if you are familiar with the poem. Even though you know it's not an HEA story it is an enjoyable, entertaining and heartbreaking listen. The story is written in a Review is based on the story and the narration not the quality of the Audiobook. The story is written in a way that brings the characters to life. Audible has this listed as horror. I personally would not classify it as horror, more YA paranormal. Jennifer Baggiero does a really good job with the narration. Nice pace and good character voices. She is able to make you feel the emotions of the characters. Recording does not sound professional quality. Sounds tinny or hollow as well as scratchy at times not sure of the correct word to describe it. If I had purchased the audio I would have returned it because of the recording quality. I really enjoyed this story. It had just enough of a paranormal twist to make another love story enjoyable. Annaleigh fell in love with William when they were children. Everyone knew they were destined to be together. So when he broke his promise to his sister Mary and proposed to Annaleigh before Christmas, no one was that surprised. In a hurry to start their lives together Annaleigh and William moved their wedding up from the summer to the beginning of February. They decided to get married rig I really enjoyed this story. It had just enough of a paranormal twist to make another love story enjoyable. In a hurry to start their lives together Annaleigh and William moved their wedding up from the summer to the beginning of February. They decided to get married right next to the lake outside of the childhood home of William and Mary. What Annaleigh and William didn't know, was that Mary had visions. She was able to see events before they happened and could do nothing to stop them. Desperately she tried to sway Annaleigh from getting married by the lake, but there was nothing she could do. I am eternally grateful to have received this because it was so beautiful, it is definitely in my top 5 books of this year, currently. The premise is what drew me to this book, Annabel Lee is my favorite poem by Poe. I am enamored with the way this novel turned out, it was a just a masterpiece. The words that come to my mind to describe this is beautiful, elegant, just perfect. The characters, Annaleigh and William, really tore my heart out with their love and I just want to infinitely say thank you to the author Erica Crouch and Patchwork Press. The writing style was so gorgeous, like reading poetry itself. The setting was perfect, for me at least, it seemed to be maybe 19th century. It is my favorite time period to read about, the corsets, horse-drawn carriages, absence of social media, the lavish gowns. I lack the words to truly describe it's beauty. Everything about this novel was perfection and I would STRONGLY recommend this book when it comes out June 17th, 2014. Annaleigh and William are very much in love. The two of them believe that their relationship is perfect and their family agrees with them for the most part, so they are very happy when the two of them announce that they are going to get married. However, even tragic things can happen to the best of couples and the two of them soon find out that this is the same for them. My favorite character in this was probably William's little sister. I found her power to be interesting and actually I wish that the novel had been told from her point of view because I found that she was the most interesting character. The other two were fine though. I found it to be an interesting adaption of the famous poem. I don't know if I would consider this novel to be YA though. It seems more like it would be new adult not that is a bad thing. New Adult is a hot new genre. This was absolutely beautiful but haunting as well. It’s an excellent story of love and loss but not a happy one. The characters were so easy to fall in love with and the writing was descriptive and expressive. This was one of those books that said all the right things. Bonus points for giving me the same feels as Edgar Allan Poe’s “Annabel Lee.” Would I read more by this author? Yes. Would I recommend this book to others? Yes. See the full review on my website, Awesome Book Assessment. I try to throw in a few romances into my year and this was one recommended by a friend. Although the paranormal aspect is not usually to my liking, I found I quite enjoyed this book. Perhaps it's because of my love of Poe, as the story line was based on Poe's classic poem, Annabelle Lee. And, much to my delight, there were other Poe references throughout the book. I found it interesting that such a young author would have such an acute understanding of grief and the depression that often accompa I try to throw in a few romances into my year and this was one recommended by a friend. Although the paranormal aspect is not usually to my liking, I found I quite enjoyed this book. Perhaps it's because of my love of Poe, as the story line was based on Poe's classic poem, Annabelle Lee. And, much to my delight, there were other Poe references throughout the book. Haunting and poignant. The gothic theme clearly translates well in this story by Erica Crouch which in itself speaks highly of the author's talent. Although one can predict where the story is headed, the intricate way that the build up was done was enough to get the readers attention and keep it. A love story worth reading. I made it to 10%. After the first chapter I knew it wasn't going well, but I was determined to at least make it to chapter 3. However, after pages and pages of no conflict or tension (aside from knowing the original poem) I had to give up when we got to the flashback within a flashback in the midst of extended expository infodump. Such a shame - it's an interesting concept.